Discussion in 'Trials' started by D2W, Nov 7, 2018. Winter is fast approaching here in south-central British Columbia, Canada. The Okanagan Valley is a high desert area and so we don't get a lot of rain/snow, but we do get some. 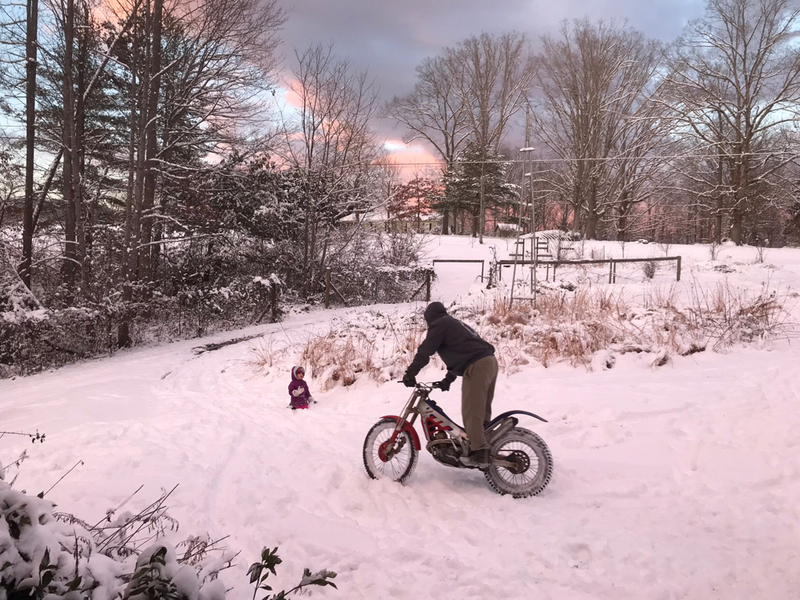 What do people do to better ride their bikes in (a few inches of) snow? 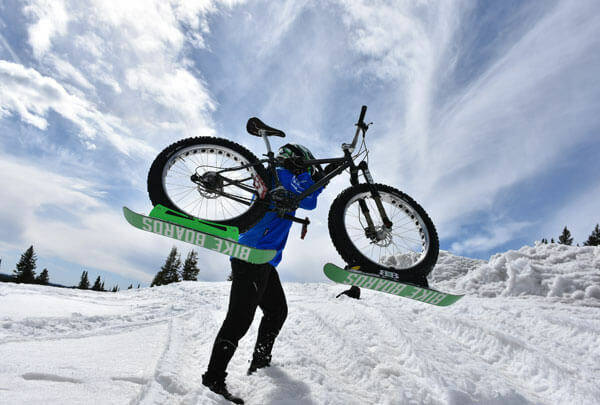 Use an enduro-type knobby tire and tube? Stud their trials tire? Remove their front fender? Anything else which is helpful traction-wise? And driving to Moab isn't an option. Shouldn't need to do anything different. One place I used to practice there was actually more traction with a little snow covering the leaves and mud. Never had a problem with the front fender clogging up with snow either--so leave it on. If there are only a few inches of snow I do not find that there is anything that needs to be done to the bike. I do however loose the chance to ride here in northern Minnesota after we start getting lots of snow. We will typically have a good 2 feet or more that stays on the ground, but it builds up in layers with a hard crust of ice between every 6 - 8 inches or so and this makes it impossible to ride in. If you are only getting a few inches I would just ride and learn how to deal with the lack of traction which is good training in itself. Huzband, Kiharaikido, jonnyc21 and 1 other person like this. If you find that the type of snow you get packs up under the fender then I would recommend finding a way to put some spacers under it to bring it up a few MM so you have an easier time cleaning it out and it builds up a little slower. For me I haven’t seen that as a problem with a few inches of snow but could see depending on conditions that it’s possible. V-Mar has some pretty cool front fender spacers for this. Dirt Dud, North ride, jonnyc21 and 1 other person like this. LemmeTry, North ride, Huzband and 1 other person like this. Most of the time, I go to the garage and practice track standing and front wheel hops with the motor off. smdub, North ride, Huzband and 6 others like this. Huzband, Norman Foley, DyrWolf and 2 others like this. If it is really cold (below -10C) you may need to adjust your jetting. Light snow if fun to ride... ice calls for studded tires. North ride, jonnyc21 and Kiharaikido like this. jonnyc21 and Kiharaikido like this. As soon as it starts snowing here the bike sits mostly, I get between 4-6’ in the yard usually. The odd time we get -20C for a week or so I can ride most places that have been sled tracked, great clutch/traction practice. I wish I had a local place to meet up with other riders and just ride. I wish more that place were my property. Im going with, 'If you build it, they will come.' Guess we'll find out. MT 007, North ride, jonnyc21 and 1 other person like this. MT 007, jonnyc21 and Kiharaikido like this. Shoveling sections eh? That is a good idea. Only problem for me is that I would have to shovel a quarter mile from my shop through the field to the woods where I have some sections setup. By the end of the day it would be drifted over. Maybe I need to setup an area behind the shop so I could plow to it with the tractor. What's wrong with you guys? Skis! What? You mean like skis glued on to the tires? Brewtus and North ride like this. DirtyTailpipe, Kiharaikido, Huzband and 1 other person like this. Brewtus and Norman Foley like this. I loved riding in snow and ice when I lived in Michigan! We even had lighted section areas. The white stuff sure teaches throttle control because as soon as you slip the tire you get a water film and... no traction. The problem was it was typically no longer possible to ride in the white stuff mmm... after about mid January. Gravity compacts the snow and you can get crust layers under new snow and you roll into it, sink and that's it. We put sheet metal screws in the tires to ride on snow and ice, and ran low low pressures. North ride and jonnyc21 like this.